That’s right. If you have a GMAIL account and reside in the US, you can make voice calls from your computer to any US telephone number for FREE until, at least, the end of the year. 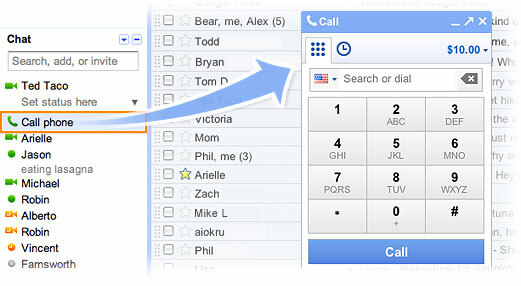 Google has integrated Google voice into their Chat application making it easy to make calls to contacts in your Gmail address book, or any other number you want. If you want to call overseas, Google is offering rates as low as $.02 per minute. Should Skype be worried? Currently, only Skype-to-Skype calls are free. If you want to call a landline or mobile phone in the US from your Skype account, you must buy Skype minutes. It’s cheap, but still not free. If you have a compatible Verizon wireless phone, you can even make free calls to Skype numbers right from your wireless phone. But why does Google care about offering a service for free? Does Skype make any money doing what they do? According to a 2009 eBay analysis, Skype is expected to have over $1.0 billion in revenue by 2011. That’s nothing to shake a stick at and Google wants a piece of the pie. So with all of this going for it, does Google stand a chance of finally de-throwning Skype as the defacto standard in computer-originated VOIP calls? How does the quality of each service compare? We’d love to hear from users of both services to see how they stack up. I’ve tried it a few times and it works awesome, even with no special equipment – talking right into my laptop. So far, you can’t get a static # can you? This is a huge difference from Vonage..